Another sunny day, cool during the night but warming up to above zero in the daytime. The forecast calls for more sunny, warm weather. I hear of more farmers finally getting their crops off; though the grains are pretty wet, at least they’re off the fields. We were at Market Mall on Remembrance Day; I had coffee at Mulberry’s and Doreen and Lucille went shopping at Safeway. It was about the only store open, besides the food court. After coffee, I walked towards Safeway to meet the girls. When I was about a hundred yards away from Safeway, I thought I could hear a trumpet playing; as I got closer, I realized it was playing the Last Post. I froze, and several other people came along and froze as soon as they realized what was happening. We stood there with our heads down for Last Post, two minutes of silence, then a few bars of Amazing Grace. For some reason, I found it an incredibly moving moment. I carried on to Safeway and found that was where the music came from – the son of the meat manager has been doing this for several years. He is a music student. At 11:00 AM, the store manager went on the public address and announced that Last Post would be played. Doreen and Lucille said that as soon as it started, everyone in the store stopped whatever they were doing and stood with their heads bowed until it was finished. They found it very moving, too. I found the store manager and told him how impressed I was with the initiative; I also asked the meat manager to pass along my respects to his son. Later that day was our second experience with Persephone Theatre. Rita, our taxi driver, picked us up right at five thirty; we picked up two more ladies, then went to Parktown Hotel for dinner. After an excellent dinner, we were taxied to Persephone Theatre. 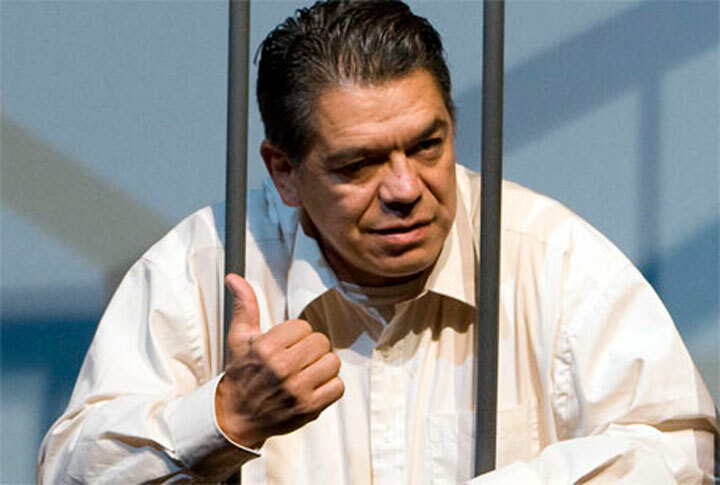 The play was “Thunderstick”, much publicized and starring Lorne Cardinal and Craig Lauzon. They were the only actors, and they also did their own scene changes, dancing around moving backdrops with the lights dimmed. Almost as much fun to watch as the play. There was a language warning, and there really was some rough language, but the play was so funny, and the acting so superb, that we overlooked the cussing. It seemed to fit, too. What a wonderful evening! Lorne and Craig apparently swap roles some evenings; I would love to see it again with the roles reversed. They are two fantastic actors. On Friday evening, we and seven of our friends from Sunseekers went to Langham for their annual Dinner Theatre. Hella McDonald, from Archerwill, and her five daughters were catering, as usual, and as usual, the meal was fantastic. Hella’s twin sister, Sela Balzer, pretty much runs the Dinner Theatre. We had a chance to visit briefly with both of them. Hella is interested in birds, and is appalled that we rarely see any. I was able to tell her about a red-breasted nuthatch that has been hanging around our trees. The stage production, Ethan Claymore, kept us in stitches. It was about a widower, an egg farmer, who had been mourning the loss of his wife for five years. His neighbour, a rotund lady with a penchant for rum and meddling, insists it’s time he came out of his shell and started living again, so she sets him up with a new school teacher. Ethan’s brother’s ghost comes along and stirs up the pot; they hadn’t spoken for fifteen years or more, so Ethan wasn’t overly perturbed when he got word of his brother’s death. A hoot from start to finish.